Curious about TPI? So are a lot of other cyclists and triathletes. In short, TPI stands for Threads per Inch. Take the time to learn about TPI, how it can impact your ride, and what bike tires we recommend. 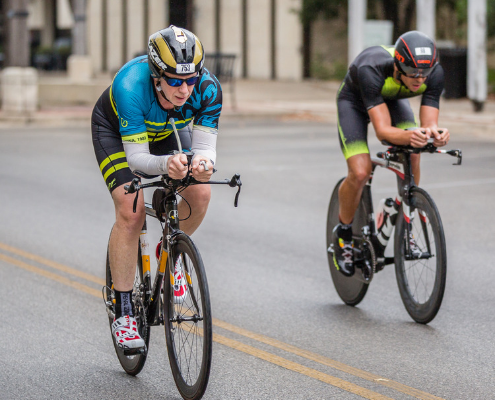 This knowledge can be beneficial during your Kerrville Triathlon training! Tires are made with threads. Lower-end tires have lower counts which tend to make them heavier and provide a harsher ride. Higher-end tires have higher thread counts which allow them to ride smoother and contour to bumps on the road better. On some tires, the threads are mixed in with Kevlar or some other type of durable fabric. This makes them more resilient to flats. It is important to note that a higher TPI tire is not more prone to flats than a lower TPI tire. No matter what the threads per inch is on your tires, there are steps you can take to prevent flat tires. Tires with lower threads per inch are less expensive and are more common for training use. Higher TPI tires are more expensive and tend to be used for racing or for riding roads where you are looking for a smoother ride. For a great low TPI tire, we recommend the Vittoria Zaffiro Tire . For those of you looking for the high TPI tire consider the Vittoria Diamante , the Vittoria Open Corsa , the Vredestein Tricomp , or the Continental Grand Prix 4000 . Check with James Balentine at City Limit Cycles to see if these tires are still good options. 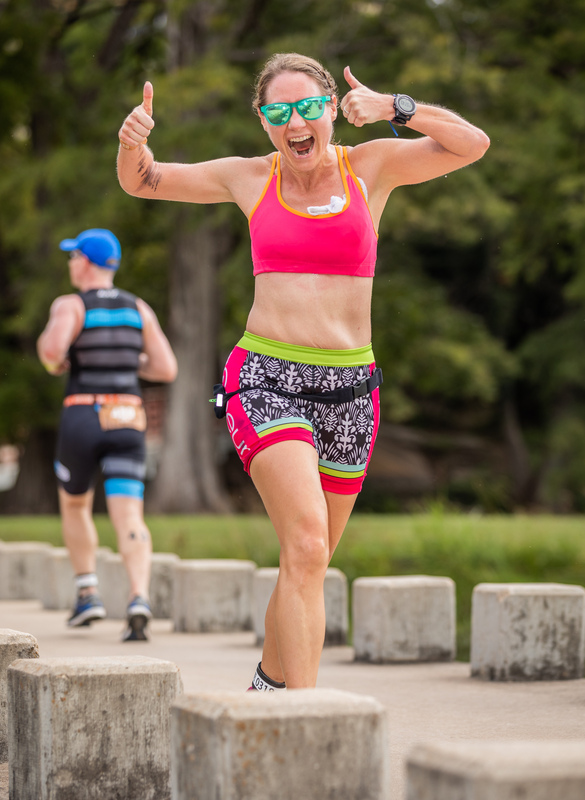 Experiencing issues shifting as you begin training for Kerrville Triathlon Festival on Sept. 28-29? Try your hand at a derailleur adjustment with these simple steps. Derailleur designers provide a simple way for you to dial in shifting. You don’t even need tools (although, it’s easiest to make and check adjustments when the bicycle is supported in a repair stand). Keep in mind, these steps are for derailleurs that are not damaged or bent. If you suspect that it is, it needs more than this simple adjustment and you should call James Balentine with City Limit Cycles. To adjust the derailleur, look at the point where the cable enters the rear derailleur. See that round, knob-like piece? That’s a barrel adjuster. It’s used to tune the derailleur adjustment. Standing behind the bike, the barrel adjuster is turned either counter-clockwise or clockwise in half-turn increments until the shifting hesitation is cured. Which way do you turn it? It depends on what type of hesitation you’re experiencing. The most common problem is slow-shifting into easier gears (toward the spokes) due to the cable stretching. But, it’s also possible that you’re experiencing the opposite. This rule will help you remember which way to turn it. If the derailleur is hesitating when shifting toward the spokes (the more common problem), turn the barrel toward the spokes (counter-clockwise). If it hesitates shifting away from the spokes, turn the adjuster away (clockwise) from the spokes. Turn it only a half turn, shift multiple times to check the adjustment, and repeat as needed to eliminate all hesitation. Group riding provides cyclists with enjoyment, exercise, training, support from other cyclists, and safety. 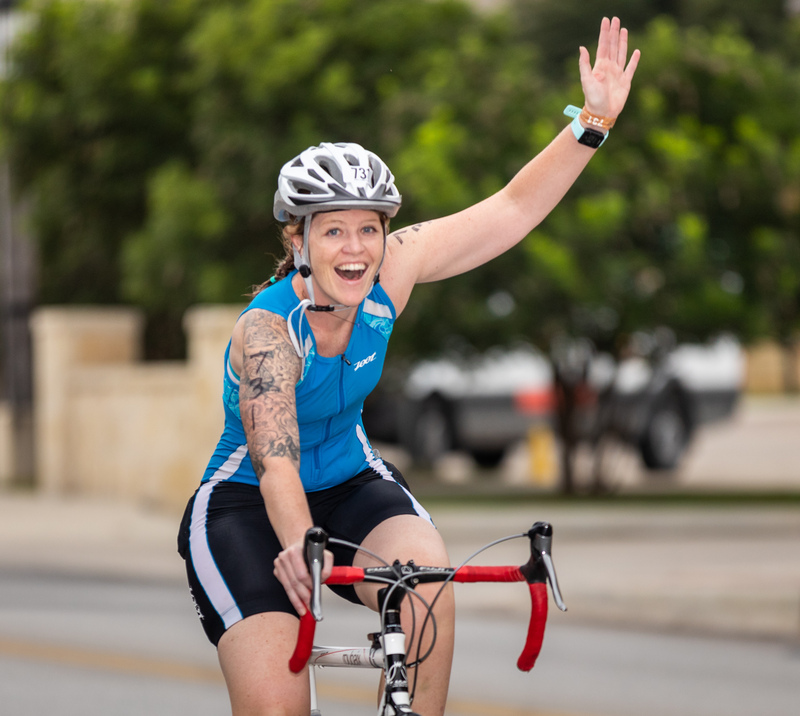 Whether you’re riding to lunch with co-workers or completing a 50-mile Kerrville Triathlon Festival training ride with your crew, the following group riding guidelines will come in handy. Knowing these basic group riding guidelines will also make the ride more enjoyable and safer for everyone involved. * Complete a quick, pre-ride safety check. * Obey all traffic laws. * Operate bike in such a manner as to not offend or endanger motorists, pedestrians, etc. * Wear a helmet for safety (and be a good model for children). * Activate all lights on bikes. * Wear reflective gear that makes the group more visible, even in the daytime. * Ride single file except in areas where it is safe to ride side-by-side. * When riding in a pack, look at “shoulder level” of cyclists in front of you. This allows you to see what is happening further up the road and not focus on the cyclists in front of you. Fixing your gaze on the back tire of the person in front of you doesn’t give you enough time to react should the entire group slow down. * It is the responsibility of the lead rider to notify the cyclist behind them of approaching issues by saying, “jogger up, cyclist up.” This includes any potential danger that may lie ahead. It is the responsibility of each cyclist to pass the caution back to the person behind them. * Avoid slowing down abruptly or making any other sudden moves. * Ask experienced riders questions when you’re not sure what is occurring. Most people do not replace their chain often enough. This leads to the gears not shifting correctly and excessive wear on your chainrings and cassette. Chain wear is affected by a few things: riding conditions, riding style (masher vs spinner), and shifting technique. When the conditions are wet the chain is going to wear out faster due to the dirt that gets in the rollers of the chain. Wet weather also tends to wash the lube off of the chain much faster. Cleaning your drivetrain can extend the life of your chain. If you ride at a low cadence you will wear the chain out faster than someone who rides at a higher cadence. The last major thing that affects wear is shifting technique. If you tend to cross chain a lot (riding in the big ring, big cassette cog or small ring, small cassette cog) then you will put more wear on the chain and chainrings. The easiest way to check for chain wear at home is to measure 12 links of your chain. A new chain measures 12 inches per 12 links. Anything over 12 1/16 inches is too long. This bike tool measures it quickly and costs less than $10. A ruler also works just fine. You should expect to get anywhere from 1500 to 2500 miles out of a 10-speed chain and about 2500 out of a 9-speed chain. You can help your chain last much longer if you take good care of it, keep it clean, shift correctly, and ride at a higher cadence. Check out our other blog post to see when other parts need replacing. ‘Tis the Season – for the Offseason! Offseason to a lot of triathletes means taking time off from October to March to help re-energize for the following season. Others focus on different sports to get out of the winter elements. The rest just simply take time off. How can you train during the offseason and keep triathlon fun on a year-round basis? The goal should be purposeful training — focus on a few key elements with your training. A great place to start is working on your physiology and the changes you can make over the winter months. Some athletes start the tri season in February in good cardio shape, but have added some extra holiday weight. Some have gone to a few too many holiday parties. They’ve ignored the fact that they are going to rev things up next season and start from square one. It is best when your body weight doesn’t fluctuate up and down. Keeping it constant is best for your cardiovascular system. Add a half marathon to your winter calendar and continue training in the offseason. The best way to keep the weight off is to run, but not like Forest Gump! Have a plan to continue running by entering a half marathon in the early part of next year. There are two great events coming up: 3M Half Marathon and the Austin Marathon and Half Marathon. The key to improving your physiology and keeping the weight off is to work on your stride rate. This means faster, possibly shorter strides during your long runs to improve the cardiovascular development in your legs. Try to pick up the stride rate without increasing your pace per mile or effort. A faster stride rate will help you develop capillaries deeper in the muscle. This will help fuel the legs better and flush lactic acid quicker. A good 3-6 weeks of this technique will help you keep the weight off until its time to work on the strength building phase of your training plan. Maximizing your power-to-weight ratio will allow you to find greater efficiencies across all three sports in triathlon. In addition to working on a faster stride rate in running, there are other ways to increase the cardiovascular network using the other sports. In swimming, you can incorporate longer, aerobic sets with shorter rest intervals. A good example would be 4-6 x 800s as a workout. Of course, you may say “how boring can that be?” So working on your technique during these sets is a must. Try taking a technique clinic to make sure you learn the proper forms of efficiency swimming. Long sets with bad technique can set you back rather than move you forward. Cycling in the offseason can improve your cardiovascular system. With regards to your cycling, keeping a heavy emphasis on high cadence work will also aid in increasing your cardiovascular network. This may keep you in smaller gears than you are used to and maintaining your cadence at 90+ rpms for 70% of the ride time. If you don’t have a cadence meter, a good substitute is to count one leg for 15 seconds and multiply by 4 to get your rpms. During the winter months, we find ourselves riding indoors and on a trainer more often. Focusing on high cadence in these indoor sessions will give more purpose to your training. Spin classes are a good place to work on this. However, using your own bike with a trainer is best as you keep your body position constant to how you will be riding on the road. Setting goals and having a purpose for your offseason training will help you stay motivated and focused during the winter training. Best of all, these few tips will help you have a much more successful racing season in 2019.
https://kerrvilletri.com/wp-content/uploads/2018/10/OffseasonKTFfeature.png 400 495 William Dyson https://kerrvilletri.com/wp-content/uploads/2018/06/2018-Kerrville-Triathlon-Logo_no-presenting-300x180.png William Dyson2018-10-24 12:20:162018-10-25 12:20:31‘Tis the Season – for the Offseason! Tune-up your bike and know how to change your own flat tire before race day. If you arrive in Kerrville and something occurred to your bike during transit, James and his City Limit Cycles van will be at your service during bike check-in on Friday and Saturday. James is also turning wrenches race morning (both days) should last-minute issues arise. He’ll set up shop at the southeast corner of T1 (off Guadalupe St.) Saturday and Sunday morning. For more than two decades, James worked as a bike mechanic at bike shops, including a decade as Head Mechanic for Jack & Adam’s Bicycles in Austin. For the past 14 years, James has traveled the world volunteering as the mechanic at Triathlon World Championships for Team USA. He has also helped Olympians for Team USA Paratriathlon in Brazil and continues to volunteer for Team USA Paratriathletes. James likes bikes. He likes to see and hear them running perfectly because he likes to see you riding them with a smile. His service experience is built around a lifetime passion for all things cycling. He’s been a pro racer, a pro mechanic, and pro-level bike geek. City Limit Cycles is James’ mobile bicycle repair company. Now a world-class bike mechanic comes to your door so you can focus on what you love most – more saddle time. We’re lucky to have someone of his caliber at Kerrville Tri for the entire weekend. Follow City Limit Cycles on Facebook. and follow his bike cleaning advice! Changing a tubular. Get ready for fun. Seriously! Many factors can lead to the need to change your tubular. Regardless of what happens, the fact remains, you still need to learn how. Make sure you have the materials below before beginning this process. Follow the directions and you’ll be cycling again in no time. Before you begin to change your tubular, be sure to stretch out the new tire before trying to mount it on the wheel. You can do this by stepping on the inside of the tire and pulling the rest of the tire up towards you. You’ll hear it stretch. Using the Teflon tape, wrap the top of the Presta valve (after unscrewing the top of the valve) with Teflon tape. Now screw the valve extender onto the valve stem, making sure to leave the valve open. Take the glue and leave a bead of glue around the rim about 1/4 inch thick. Insert the valve through the valve stem hole. As you pull the tire down over the wheel be sure to stretch it and the tire should slip on the wheel. Inflate the tire to about 50 or 60 lbs. so the tire takes it shape. Let the wheel dry for 24 to 48 hours before riding. BE SURE TO INFLATE TIRE TO MAXIMUM PSI, for most conditions 140 is sufficient. Failure to inflate tires before riding could result in a race day crash. No one wants that. While you’re hanging around this summer, why not try your hand at making sure you have a clean drivetrain? With these simple steps, you’ll be the grease monkey you always dreamed of being! Not only that, but keeping your drivetrain clean and lubed extends the life of your bicycle and helps maintain proper shifting performance and pedaling efficiency. 1. When riding primarily on roads, you should clean and re-lube your chain at least once every three or four rides, depending on the conditions (rain, excessive road grit, etc.). 2. Run the chain backward through a clean cotton rag until the chain is fairly clean and dry. Lube the chain with your favorite lube, making sure that some lube gets on each link. Run chain back through the rag once more to remove excess lube. Don’t have a favorite chain lube? Check out 2 of our favorites White Lightning Clean Ride or Bike Medicine Purple Extreme. 3. Clean the cassette or freewheel. You can “floss” the cassette or freewheel with a clean rag to remove built-up gunk. If it is really dirty, you may want to scrub the cassette or freewheel cogs with an old toothbrush and some de-greaser. 4. Wipe off your front and rear derailleur. Afterward, spray the derailleur pivots with a light, penetrating lube. 5. Wipe off your chainrings from time to time with a clean rag. If they are really dirty, you may want to scrub them with an old toothbrush and some de-greaser. 6. Clean the rear derailleur jockey wheels from time to time with a clean rag to prevent the build-up of gunk. If your chain is really dirty, you may need to remove it to clean it properly. However, if you regularly follow the steps above, you will not need to do this. You can buy chain cleaning kits which run the chain through a solvent bath. You can also use a wide mouth soda bottle, Gatorade bottle, or old water bottle as a chain bath. Again, following the recommendations above should keep your drivetrain clean. You should generally replace your chain every 2000 miles. If you wait longer than that, your old chain may begin to put undue wear on your cassette or freewheel. Don’t forget to wash your bike!